We are regarded as one of the eminent UPS Batteries manufacturers and suppliers from India. We exhibit an indispensable range of Power UPS batteries that are widely appreciated for their features like low maintenance, durability, high precision and heavy duty usage. These are provided with sealed float indicators as well as micro porous Aqua Trap vent plugs that traps water particles and allows in the escaping of gas. Finding various industrial applications these rechargeable Home UPS Batteries are highly demanded by our nationally located customers for their characteristics. We ensure easy availability of these chargeable batteries and at the most cost effective prices. TPC tubular batteries are designed for heavy duty usage, low maintenance, long life and high performance. Our Batteries are the major investment in UPS application , so we are focused much on extending battery life and performance. When the battery used with TPC UPS having better battery management controls will give extended life for batteries. 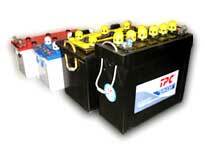 TPC Batteries are assembled with tubular positive and pasted negative plates made of a special alloy. They are provided with transparent sealed float indicators and micro porous Aqua Trap vent plugs, which allow generated gas to escape and traps water particles, returning the major portions to the electrolyte. This reduces the frequency of topping up. With proper voltage control, the frequency of topping up will be about once in six months in case of 12V batteries and in case of 6V batteries with an extra electrolyte head, the frequency of topping up will be once in a year.